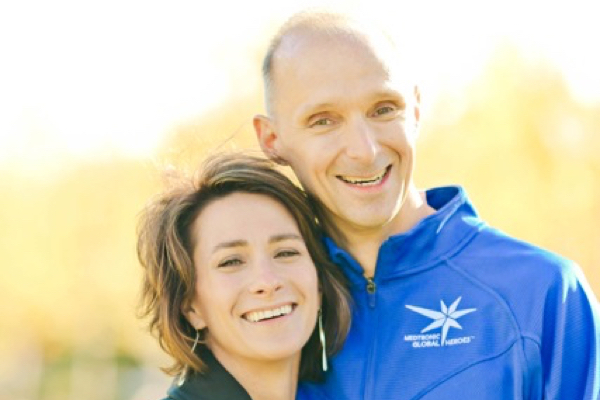 Michael was was selected as a Medtronic Global Hero in 2015, and Ironheart is his new passion. My early athletic life was average. My older brother was a standout on the track and cross country teams while my younger brothers played football and ran. I played on numerous basketball teams over the years and still managed a pretty good game of golf. But, I didn’t have endurance and couldn’t run. When I was 25 and a first year medical student, I discovered my heart murmur. The day after I was diagnosed with a congenital bicuspid aortic valve. I remember the cardiologist saying without hesitation, “maybe when you’re 70, you will need a valve replacement.” I only worried a little. I was advised to stop lifting weights but was told cardio was fine. Researching backwards, it had been there since birth I was a healthy kid with no major health complaints. I started running. While I couldn’t handle long distance, I was reasonably fast. Every couple of years, I saw a cardiologist who gave me the same news. “You are in great shape, no worries,” they said. I became a successful ophthalmologist, got married, three kids; life was perfect. Then September 2011, my cousin of the same age had an attack of supraventricular tachycardia (SVT) on a golf course and went into a coma. While I was visiting her in the hospital with her grief-stricken husband and a lonely 5 year-old daughter, I decided to get a fresh opinion on my heart although I felt fine. I saw Dr. James Fang at University Hospital in Cleveland. He took peculiar interest in the fact that throughout all my years in sports I had managed to break 14 bones, and he suggested an echo and an MRI. The echo showed the same floppy bicuspid valve getting worse. “Come back in a year,” he said. The MRI came a month later. I was out for a 5 mile run on a Sunday afternoon late October. When I got home, Dr. Fang had left numerous messages for me not to run and to not exert myself. The MRI showed I had a 6cm ascending aortic aneurysm. As a physician, I knew what this meant. At that moment, my life seemed to stop. I was a diligent patient, seeking multiple opinions of diagnosis and treatment. When I met Dr. Alan Markowitz, my search was over. He understood me and my goals. I did not want blood thinners; I wanted to remain very active. I was angry, scared, meek and motivated. I worried about my family and my own patients. I felt fragile and on the edge of being broken. I was told that I was lucky, but I felt the opposite. My surgery took place on December 5, 2011 which included an aortic aneurysm repair and aortic valve replacement. I joined the community of my patients who now live with frailty and strength of the human body. I thought I would live forever, callously and without consequence. But now living that same life would take work. One month after surgery, I started to run. As I ran, a block became two, two blocks became a mile, and two miles became ten miles. I have run almost every day since. My first race was 8 months post surgery which was a 5K, and I finished 9th overall! I scheduled more races as motivation targets. I could run farther and faster than any point in my life. Prior to my diagnosis, I never thought that I had a symptom, but I realized that my symptoms had been there for 44 years! 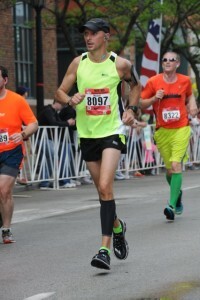 I ran my first half marathon 1 ½ years after surgery. Six months later, I added a 100 mile bike race, and I started competing in Olympic triathlons. In 2014, I had another flash with my life when I was sideswiped by a hit and run car training while on my bike. I fractured my clavicle and required surgery that included placing a titanium plate and screws. My wife tells me that my hurdles have allowed me to seek and climb these mountains. Anyone facing a terrible diagnoses needs to relinquish control to those around you. My perspective has helped to realize this. My new accomplishments are not for all heart patients. Your mountain doesn’t have to be a literal mountain, it can be a staircase or a mailbox or a loop around the block. Heart disease can mean depression and despair; or it can be a step to a happier life you never knew. I continue to train every day. I train to race, but I train because I can. I train for my family, my children, and my patients. I hope to inspire others with serious health issues. I was selected as a Medtronic Global Hero in 2015 and ran in Minneapolis. I embraced my heart brothers and sisters all around the world. There I met Dave Watkins of Ironheart Foundation. His story inspired me to continue on my path, and Ironheart is my new passion. I will be one of three featured heart patients in a soon to be released commercial for University Hospital of Cleveland’s “Get Pumped” campaign for the Harrington Heart and Vascular Institute. I have contact with so many patients that are sick and diseased. Who better to look to than your doctor to say, ”you can do this.” I may not compete in Ironman distances, but with Ironheart I will do more than just survive heart disease, I will LIVE with heart disease.